From the lonely dark comes a story of hope. In a small village on the outer edge of the tourist-filled Mount Elgon National Park in Uganda, a child frantically yelled, “Stop! Please, stop!” He was trying to get the attention of a community leader driving through. The child explained the desperate situation of a jjaja—an elderly woman or grandmother—named Kolofona, who was locked up in her house. With hundreds of jiggers infesting her hands and feet, Kolofona had been largely abandoned by her community. Worse, they pretended she didn’t exist. To them, the disease was a curse that must be contained; a curse that must not spread; a curse that isn’t spoken of; a curse that will end when the old woman does. Unfortunately, there is a social stigma in Uganda associated with jiggers that often causes infected individuals to be teased, taunted, or bullied. In some cases, like Kolofona’s, they are even locked in their homes because of a belief that the infestation is a result of witchcraft or evil spirits. The community leader listened carefully to the child’s story, and he knew what to do. Because he had heard of Sole Hope’s work in the area, he contacted Fiona, one of Sole Hope’s social workers. The child and the community leader had only a general idea of where Kolofona was, so Fiona quickly traveled to the area and spent an hour going from village to village gaining information and clues, traveling on washed-out dirt roads and up and down steep hills. She knocked on doors, looking for local leaders and hoping to learn more. Soon, she came to a home that was nailed shut from the outside. She took a rock to the door and got help from the village chairperson to take down the door. I had lost hope and was praying for God to take me. When Fiona stepped inside, she found Kolofona in a fetal position. Her eyes squinted against the sunlight that streamed in through the doorway. Her hands and feet were swollen and calloused from the jiggers that had burrowed inside. The resulting pain left her unable to walk, much less move. “When they found me, I had lost hope and was praying for God to take me,” Kolofona said. Sole Hope’s team of social workers and the local authorities carried Kolofona to a vehicle. As they drove away, there was a sense that the villagers didn’t expect Kolofona to return and that this would be the last time they would see the 85-year-old grandmother. She was being taken somewhere to die. After a three-hour drive, Kolofona was laid into a bed at the Sole Hope outreach house in Jinja. The next morning, the staff began removing more than 500 jiggers from her hands and feet. Over the next few weeks, the staff vigilantly watched over her, removing jiggers and caring for the wounds as they healed. They sat with her and cared for her both physically and emotionally. Francis, Sole Hope’s educator, taught her about the causes of jiggers and how to prevent future problems. 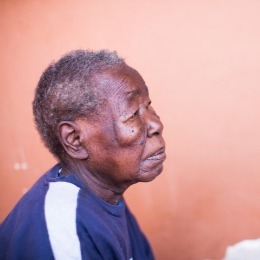 As the days passed, Kolofona soaked in the sunshine as she sat on the porch at the outreach house. She ate healthy meals. She laughed with kids playing in the yard. She learned to walk again. Most of all, she learned that she was loved. I was alone, and I was in need, and then I was rescued. I was shown I was loved and shown that I am valued.…Thank you for loving people who look like me. 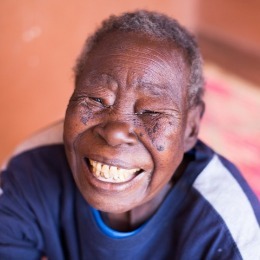 When Kolofona returned to her home, the people in the village celebrated her transformation. Things still aren’t easy for Kolofona. She’s frail and lives alone. However, a young girl from the community is helping her around the house every day. When Kolofona falls sick, someone gives her a ride to the local clinic. People know her story now. People see her amazing transformation. She is living proof that there is hope for people with even the worst cases of jiggers. There is hope for the lonely. There is hope for the vulnerable. There are second chances even in the darkest hour. Thank you for providing that second chance. Thank you for funding hope.